In the most beautiful and suggestive zone to the North-West of the splendid island of Ischia. With terrace overlooking the sea from where the view fades into the bay of San Francesco and, to the left, into the historic and particular country of Forio with its port, Torrione, the church of Soccorso, its amazing red sunsets, the mysterious green flash. From the terrace you can admire the crystal sea or, at night to observe the bright background of waters and relax yourself in the fresh marine breeze. Come to visit us to make special your holiday in Ischia! The menu is based on the fishing and period. 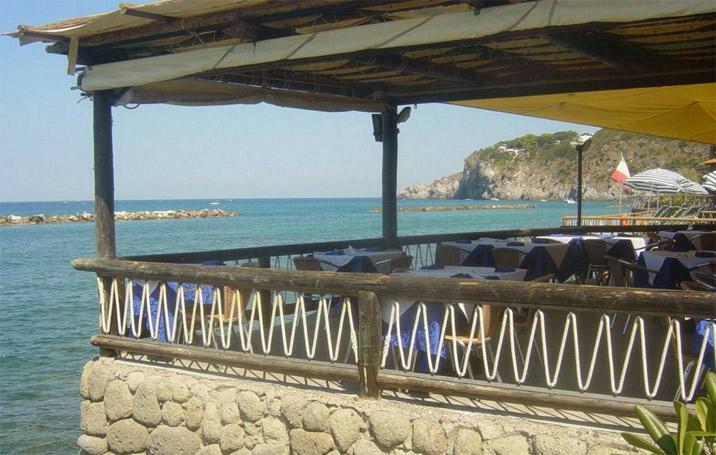 Some specialities of the Restaurant and Bar are the sea salad, linguine with seafood, fish soup, bruschetta, the mega salad Fortino, sandwiches, caprese, cappuccino 'Monte Epomeo' and much more. To the West of the island of Ischia, in the municipality of Forio, a terrace built upon a green tuff rock on the sea, easy to reach by car or on foot.